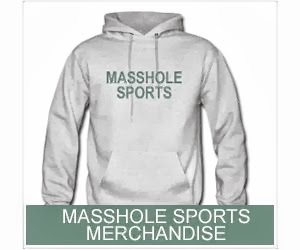 Masshole Sports: Jonathan Toews Wins Selke Trophy Despite Getting Less 1st Place Votes Than Patrice Bergeron. Jonathan Toews Wins Selke Trophy Despite Getting Less 1st Place Votes Than Patrice Bergeron. Patrice Bergeron was edged out by Blackhawks center Jonathan Toews for the Frank J. Selke Trophy, which is given “to the forward who best excels in the defensive aspects of the game,” as voted on by the Professional Hockey Writers’ Association. 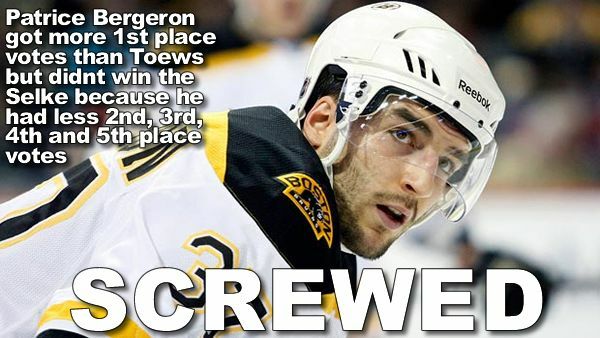 With 1260 points, Toews finished just 10 points ahead of Bergeron, who had 1250. Bergeron had the most first-place votes with 78 to Toews’ 75, but Toews’ combination of first, second, third, fourth and fifth votes surpassed Bergeron’s total.